This morning, non-government organisation Institut Onn Ja’afar (IOJ) honoured the almost 1,000 student-volunteers of their JOM BEKPES morning soup-kitchen campaign who served and ate breakfast with homeless people and underprivileged kids in Kuala Lumpur this year. IOJ patron Dato’ Seri Hishammuddin Tun Hussein Onn was present at the Dato’ Teo Hang Sam Auditorium at KDU University College Utropolis Glenmarie Campus to award JOM BEKPES 2016 Best Volunteer to Universiti Selangor (Unisel) student Hanis Farhanah and Best University to Universiti Kebangsaan Malaysia (UKM). 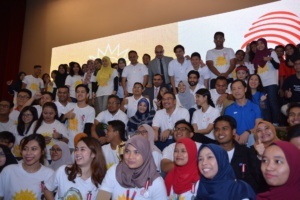 He also awarded 100 student-volunteers, who were appointed as IOJ ambassadors with medals featuring the likeness of his grandfather, Dato’ Seri Onn Ja’afar. The ambassadors will be facilitators and mobilisers of IOJ volunteers in their respective institutions. Since February, each of IOJ’s JOM BEKPES, JOM SAHUR, JOM RAYA and JOM DIWALI sessions were hosted by 40 student-volunteers from 25 Malaysian private and public universities and student associations. There have so far been a total of 28 sessions of JOM BEKPES (22) including JOM SAHUR (4), JOM DIWALI and JOM RAYA (1 each). Each session of JOM BEKPES and JOM SAHUR helped around 500 people including around 50 kids while between 150 to 200 people received food at JOM DIWALI and JOM RAYA. 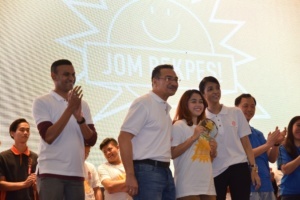 IOJ also honoured its sponsors, partners, and supporters who had contributed to JOM BEKPES. In all, around 2,000 students attended the event alongside sponsor VIPs, independent volunteers, supporters and partnered NGOs. 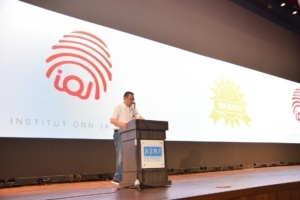 The event today was co-hosted by KDU University College which also announced their commitment to channel all KDU students taking Corporate Social Responsibility as a subject towards charity programmes organised by IOJ. The commitment is part of KDU’s Youth Empowerment Plan, which was launched today by YB Dato’ Seri Hishammuddin. In line with the Malaysia Education Blueprint (MEB), KDU’s Youth Empowerment Plan is anchored on 5 main pillars – Career (KDUCareerExploration), Culture (KDUCulturaltion), Fitness (KDUFitspiration), Sustainability & Awareness (KDUSustainability) and Entrepreneurship (KDUHatchUp), and aims to produce well-rounded graduates through various action plans in these 5 pillars. IOJ’s upcoming Malaysians United Run 2017, which will be held in November next year, was also announced at the event as a continuation of IOJ’s first charity run held in 2015. 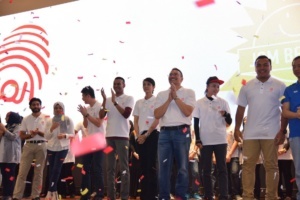 With 17,620 runners recorded by the Malaysian Book of Records, the 2015 run was recognised as the Largest Participation of College Students in a Volunteerism Campaign Run and raised RM100,000 for five charity homes. “If we do not rise up with a movement that is more constructive, we allow and permit extremists to take advantage and if they take advantage, at that point, it will be too late. “That is why IOJ is gathering the energy of our youth, from different races and religions for good, for peace, to help those who are less fortunate and are in need of protection. “From the energy that I saw in the hall today, from the youth of different races and religious backgrounds, I think that is a fantastic sign to counter extremism, to counter the ideologies of IS and Daesh, to counter those that are now looking at us and trying to exploit our fault lines and weaknesses for their own aims and evil intentions,” he said. For further information, contact Hamzah Nazari at 019-261 5931 or +603 7734 5799, or email institutonnjaafar@gmail.com. Institut Onn Ja’afar (IOJ) is a non-profit organisation based in Ara Damansara Petaling Jaya with a Volunteer Centre in downtown Kuala Lumpur, Malaysia. IOJ cares about the poor and vulnerable, and strives to provide temporary relief from their sufferings and material aids for their immediate benefit. We aim to recruit, mobilise and be an avenue for volunteers, and promote the idea of volunteerism through a network that spans the entire nation. Our volunteers find their lives changed and rewarding by simply serving others selflessly. To find out more, visit http://institutonnjaafar.com/ or search for “Institut Onn Ja’afar” on Facebook, Twitter and Instagram. KDU, an institution that has over 33 years of history and experience, believes in providing real world education to meet real world needs, and has traditionally, been successful in producing competent graduates and preparing students for top universities all over the world. Established in 1983, and a pioneer in Malaysian private education, KDU was one of the first private colleges in Malaysia to have its own purpose-built campus. The institution, as KDU College then, was awarded the university college status in 2010 – a reflection of its quality programmes, and the growth of its international student population. KDU University College offers a wide range of programmes at Certificate, Diploma, Degree and Masters levels, and has introduced home-grown degree programmes that are at the forefront of growing industries. These include hospitality, tourism and culinary arts, game development and computing, communications and creative arts, business, as well as engineering. KDU University College is a member of Paramount Education, a fully-integrated education services provider for primary, secondary, tertiary, and postgraduate level studies as well as executive and professional development programmes. (From left) KDU Deputy Vice Chancellor (Academic) Assoc Prof Dr Hon Wei Min, KDU Vice Chancellor Prof Dr Hiew Pang Leang, IOJ patron Dato’ Seri Hishammuddin Hussein, and IOJ CEO Charles Mohan. 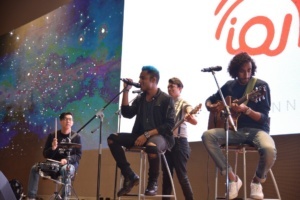 Local pop band Paperplane Pursuit performed for the student-volunteers at IOJ’s JOM BEKPES Volunteer Appreciation day. (From left) Dato’ Seri Onn Ja’afar’s granddaughter Anis Hussein Onn, Datin Seri Tengku Marsilla Tengku Abdullah, IOJ patron Dato’ Seri Hishammuddin Hussein, IOJ Charles Mohan and KDU Vice Chancellor Prof Dr Hiew Pang Leang. IOJ patron and Defence Minister Dato’ Seri Hishammuddin Hussein thanking student-volunteers for serving breakfast and eating with homeless people and underprivileged kids this year as part of Institut Onn Ja’afar’s JOM BEKPES campaign. (From left) IOJ CEO Charles Mohan, IOJ patron Dato’ Seri Hishammuddin Hussein, JOM BEKPES 2016 Best Volunteer Hanis Farhanah, Datin Seri Tengku Marsilla Tengku Abdullah and KDU Vice Chancellor Prof Dr Hiew Pang Leang. 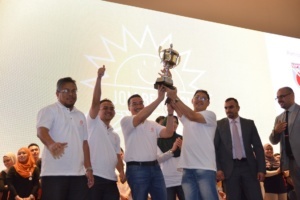 IOJ Patron Dato’ Seri Hishammuddin Hussein hoists a trophy with Universiti Kebangsaan lecturers in celebration as UKM was awarded JOM BEKPES 2016 Best University out of over 25 institutions and student groups. IOJ patron Dato’ Seri Hishammuddin Hussein and KDU Vice Chancellor Prof Dr Hiew Pang Leang sign a memorandum of understanding on the partnership between KDU and IOJ which will channel students towards volunteering in charity programmes.